Cheers to one & all on this summery Thirsty Thursday!! I had the pleasure of attending the Michigan Summer Beer Fest this past Saturday and I think I’ve finally recovered. It was sunny. It was hot & humid. This pasty-white, typically sweaty chic took awhile to adjust to the weather. Yes, I’m a puss in the heat. Don’t know how I made it through 3 summers in Arizona. Unlike the Winter Beer fest, where you can add layers and sit by a fire to stay warm… or simply ingest more alcohol, Michigan’s Summer Beer fest provided some interesting ways to keep cool. I ran through a couple of sprinklers; we were welcome to bring in our own chairs, snacks, Gatorade & water — this really helped. That and putting a little alcohol on it so I forgot all about the heat… my GOD the heat! After standing in the Beer Fest line that seemed close to a mile long, it moved fast, and as soon as we entered Riverside Park in Ypsilanti, we found a tree and set up “beer-camp” under it before hitting up the first brewery. The heat took me off guard, and any plans I had made… including must-try beers basically went out, well, down the river. I was going with the flow for Summer Beer Fest, and I was absolutely ok with that. Summer Beer Fest set up was spread out, but the welcoming community of friendly beer lovers was the same. Like Winter Beer fest, I never saw anyone throwing-up or start a fight, and even though someone stole our cab as soon as it started raining about a half-hour before the beer fest ended… the rain felt good and another friendly cab-driver waved us in about 5 minutes later. Craft-beer drinkers & their supporters are generally awesome, what can I say? Getting Better All the Time. The live music rocked (we barely knew bands existed at Winter Beer fest), but the free 3:30p Firkin from Bell’s for the community toast on the stage was better. Speaking of Bell’s, I also enjoyed Bell’s Batch 10,000. I’m not a die-hard Bell’s fan, but their showing at this beer fest was steller. They offered up special brews hourly from a separate tent. So if you wanted Oberon, for example, you went to their table. If you wanted the 2p Batch 10,000 you had to go to their exclusive tent. Dark Horse Brewery had a beer for everyone. You enjoy IPAs? They had 2 entire tables of IPAs. If stouts were more your game like MOI! they also had a table full of stouts… Dark Horse brought 40 beers and were spread out over 6 tables for this shindig! Pretty incredible. One of the favorites in our group was Dark Horse’s Red Hot Shocker. Sounds like a bizarre beer, yes? It was, but it was good enough for our entire group to get seconds. When you smelled the medium-bodied lager, your nose filled with the familiar red-hot cinnamon aroma, but one swig of this beer and your mouth wondered how they made it smell one way, but taste of jalapenos… yet surprisingly thirst-quenching! Don’t know if I’ll ever see that beer again. One of the bitter-sweet things about beer fest: the exclusive brews you may never see again. Let Down and Hanging Around. I don’t have much to complain about, but I do feel the urge to mention that 2 of my favorite breweries let me down a little. Founders basically offered up the exact same beer they have on tap here in GR. So, I didn’t waste my tokens on beer I can & do drink often, right from the source. No specialty brews that I knew of. Come to find out later, I should’ve stopped by just for the KBS (which they only had on tap here in town for what seemed like a week!) Not quite as special when there were plenty of other Bourbon Barrel Stouts available… but still. Would’ve been nice if the flyer was updated to highlight this. And Shorts… my lovely Shorts were in the back-forty, near the toilets. So I didn’t get to them until I broke the seal… and Shorts had one single keg of beer left. The Cornholio, which was interesting, made with popcorn… but not as tasty as their Carrot Cake Ale I fell in love with at Winter Fest. Another disappointment? The sour stomachs we weren’t prepared to deal with. A trip to Arbor Brewing for dinner was a good idea… until we got there and all took turns whining about how tired we were & complaining about our stomachs. Eh… can’t win em all. The Summer Beer Fest venue at Riverside Park in Ypsilanti was perfect… so perfect that I never had to wait in a line to use a porta-potty. And I visited them several times on Saturday. Believe me, that’s huge for a Momma and could’ve fallen under my Best in Show banner! Overall, it was a beautiful day I’d do all over again in a heartbeat. 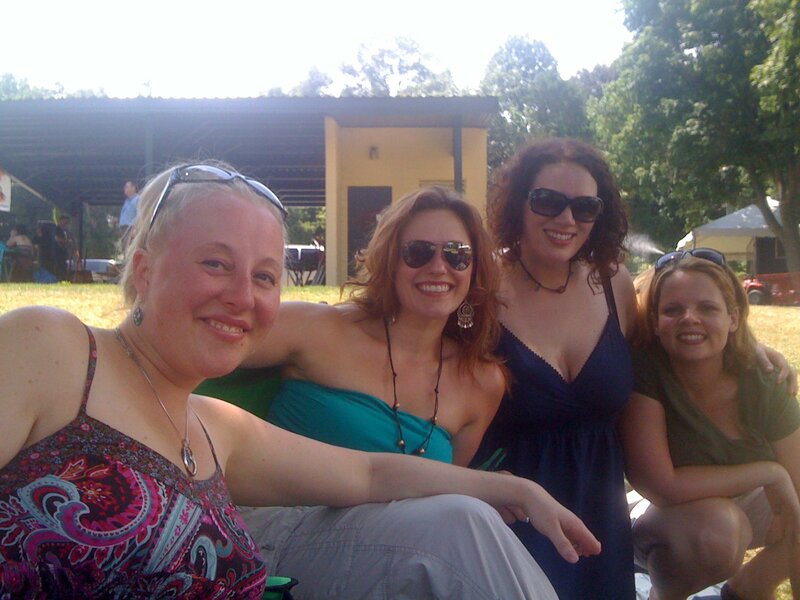 Great friends, good beer, beautiful community of people… what more can a girl ask for? Michigan’s Winter Beer Fest is 7 months away, the last Saturday in February here in GR. I urge all of my fellow beer-lovers to plug it into your 2012 calendar!! Who’s coming with me?? 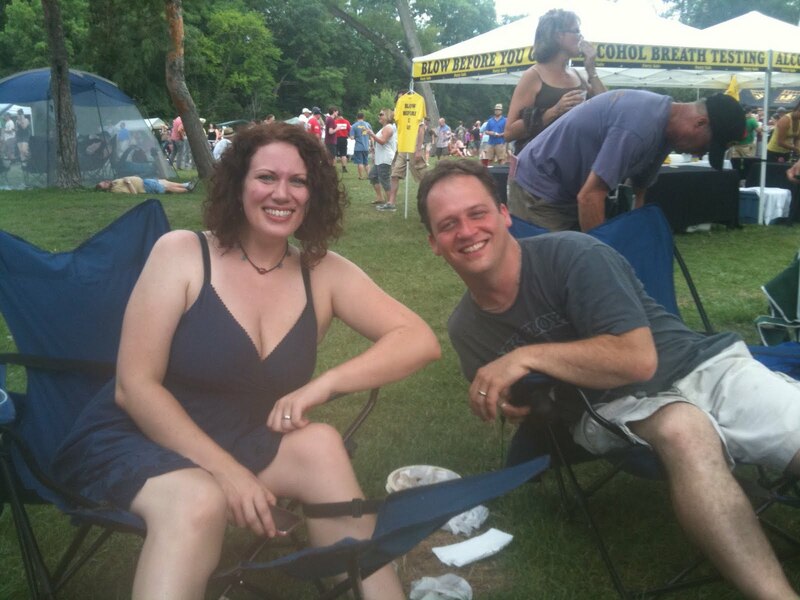 This entry was posted in beer and tagged beer, Michigan beer, summer beer-fest, thirsty thursday. Bookmark the permalink. Post a comment or leave a trackback: Trackback URL. I had a stupendous day as well! And, in my humble opinion, the beer played second fiddle to the amazing friends and laughs we shared. See you at Winter Fest! Oooooh, we are just northeast of k-zoo and my hubby is a certified beer judge. We TOTALLY should plug that February date into our calendar!